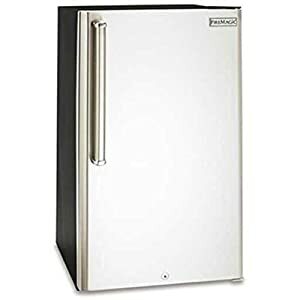 22 Best Outdoor Refrigerator Reviews: Top-Rated for April 2019! There is a very significant difference between the outdoor and the indoor refrigerators. We keep a steady temperature in our houses for each of the four seasons, so our indoor freezing units are functioning in a relatively stable environment. At the same time, the weather outside changes a lot from season to season and even from morning till evening. Thus, the outdoor refrigerators should be capable of keeping the even internal climate conditions while performing in a changeable surrounding. If you’ll read my review of good outdoor pizza ovens, you’ll find out that outdoor refrigerator must not be placed near the oven. The second crucial distinction is that outside fridges must be waterproof. It is a necessary condition for an accessory working outside the house. That’s why the fridges rated for outside use must perform well despite a rapidly changing temperature outside and maintain even freezing conditions inside. They should have a powerful compressor and a good ventilation system to prevent icing and overheating. The best outdoor refrigerators also need to be protected from weathering and any kind of environmental influences. That’s why they are usually covered with a stainless-steel finish. Please note that it doesn’t mean you can leave your new fridge under a heavy rain for a couple of days, ha-ha! Stainless steel is a very enduring material, but there are different types of steel and it can also eventually rust. You can choose the right item according to your needs, they all have their advantages. 7. 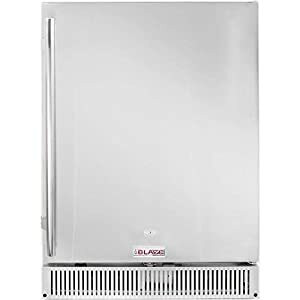 Blaze Outdoor Rated Stainless-Steel Refrigerator (BLZ-SSRF-50DH), 5.2 Cu Ft. This item is respectively rated to be used outside. This rating is possible, because of its stainless-steel construction. This lasting material can cope with all outside effects, such as moisture and debris. It can be installed as separate or as an inbuilt application. There are two possible installation positions because this item features the frontal ventilation system to prevent overheating. The device can effortlessly fit in 142 standard 12 oz. cans. It is an average capacity, which is quite enough for all your beverages, ingredients or leftovers. The freezing process is ensured by the powerful compressor, which will chill all the items inside and keep them cool even on the hottest day. The refrigerating temperature range is 38-50F. The internal freezing temperature is adjusted by the straightforward controls. This freezer features an auto-defrost system Well, this thing really helps to simplify the maintenance of this machine! The structure of this cooler includes glass shelves, an installed lock, and a carbon filter. The door is reversible for customization purposes. You can switch it so that it opens from the right side. You can install this item inside or outside the house, according to your desires and purposes. This is an excellent outdoor compact refrigerator. The weight of the item is 97 lbs. The dimensions are: 33 1/2″ H x 23 1/2″ W x 22 1/2″ D (24 3/4″ D with handle). 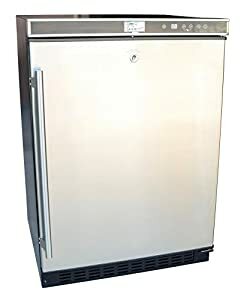 CalFlame Outdoor Refrigerator is produced from stainless steel, which is a very practical and enduring material, especially required by the outdoor freezer units. This freezer has 3.25 cubic feet of depot capacity. It is a bit smaller than the average capacity, but still quite enough for all of your items. 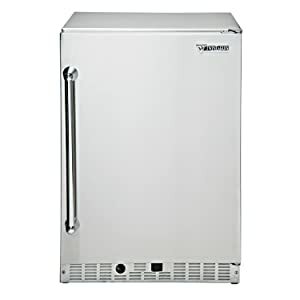 This fridge is characterized by 115v for quick and favorable immediate use. This is a fully enclosed/insulated item. This means that it can easily cope with the weathering and outside influences. It is capable of maintaining even inner temperatures in unpredictable circumstances. The cooling system consists of the fans which direct compressor-generated heat through the front vents. The front venting system prevents overheating of the item and allows you to install this freezer as a built-in unit in your summer kitchen. The temperature range of this cooler is 35-50 F. This item is very quiet because the fans provide no extensive noise. General product dimensions are 23”H x 14.5”W x 33”D and it weighs 76 lbs. This freezing unit is graded for outside use and provides single zone cooling unit for the consistent internal temperature. It can be installed as a built-in unit or as free kitchen application because it features the front ventilation system. The freezing range of this device is 34–50F. It is one of the best full-size outdoor refrigerators. The front vent, the handle, the exterior cabinet and the door are made of stainless steel to cope with any environmental influences. Such well-thought design provides the item’s durability and reliability. This item features a nice customization possibility – you can choose the internal LED light color. There are two light color options – white and blue. There are also two lights on each side of the cabinet for the extra lighting. The freezing function is powered by the compressor to keep all your beverages and food chilly and fresh. The compressor is protected from weathering by the steel coating. The item includes the carbon filter. There are also three sanded-glass shelves and door storage for beverages. There are four available casters for added mobility (optional). You can easily move around this fridge with their help. The dimensions of the cooler are 34.5″ H x 23.9″ W x 24″ D (without the handle). The weight is 84 lbs. 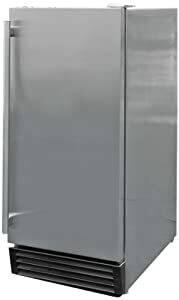 Another thoughtfully-designed and effective item on my list is Sunstone Stainless-Steel Outdoor Rated Refrigerator. It is constructed from a solid material to resist any environmental influence. It is not only rated for outside activities but is also UL-approved. Approval of Underwriters Laboratories means that this item has passed lots of tests, proving its safety and ability to cope with the moisturized surroundings. All parts of the fridge which feature electrical structure must be covered and protected from water. It is necessary for any item working in an unsteady surrounding to provide customers with safety. An easy and comfortable installation as an inbuilt unit is ensured by the frontal venting technology. The cooling device is equipped with the shelves for comfortable use. They are strong enough to hold all the products you want to keep inside and are specifically produced to beautifully divide and manage the inner storage space. The item’s door is equipped with storage units for different beverages. So you can put there anything you like, for example, juice, milk or a bottle of wine. The size of this cooler is 4.1 cubic feet and the general dimensions are 21-1/4″W x 33-3/8″ H x 22-5/8″ D. It weighs 9 lbs. 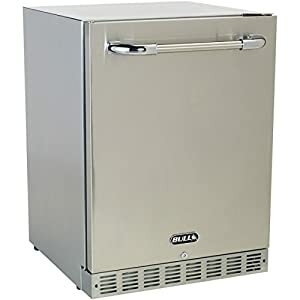 This item is well-constructed and precisely produced to be comfortably used outside the house; it is one of the best outdoor refrigerators on the market. This item is a necessary accessory for your summer kitchen because it has strong cooling capabilities and a stylish design. The general capacity of the item is 4.8 cubic feet, which makes it quite spacey. It is equipped with a door lock for the safety and tight sealing. If you are leaving something in the freezer when you are away, you might want to lock it up. Stainless door front holds off different environmental influences. It is constructed to resist wet conditions and prevent rusting of the item. Another great advantage of this fridge is its functionality and a high level of customization. There are lots of possible adjustments. You can adjust feet/levelers, thermostat, and glass internal shelves. By modifying the shelves, you have a great possibility to manage the internal storage space according to your desires. This item also has two internal drawers and is characterized by automatic defrost system. This makes it very beneficial to use and simple to maintain. The door is adjustable and can be reversed to be opened either from the left or from the right, according to your needs. It is a great advantage, as this cooler suits any kitchen. The dimensions of the item are: 21.75″ W x 22″ D x 33″ H. It weighs 55 lbs, which makes it quite lightweight. I should definitely name dynamic freezing technology among the numerous advantageous features of this item. It makes the cooling process really quick and provides temperature stability. The freezing capability range of this item is within 34– 42F. Among the outdoor compact refrigerators, this one is definitely worth your attention, because it provides rapid cooling. The Marvel Prim allows precise setting of the temperature and ensures a free-frost management. You can easily choose suitable chilling conditions and keep it steady, despite the changeable surrounding. This item includes two slide-out shelves made from stainless steel. They are fully adjustable for the higher customization. They are easily cleaned, which makes maintenance pretty easy. And, by sliding the shelf out, you can easily access all the storage contents. The exterior of the fridge is corrosion-resistant thanks to stainless-steel structure. It is equipped with a sturdy handle and a rugged 4” adjustable flat toe grill. The device goes with the included lock, which is a necessary accessory for the item manufactured for the outside use. This item can fit 154 12-oz cans. The product dimensions are 21.5” x 23.9” x 33.8” and it weighs 117 lbs. You will be amazed at how durable this fridge is! Stainless-steel construction makes it as stable as Iron Man! It has a great depot space – 5.2 cubic feet. There are three included shelves. You can easily adjust their position according to your needs; the adjustment requires no special tools. Blaze freezing unit features the front venting system for easy and efficient built-in installation. At the same time, it can be installed as a separate application, so don’t forget this tip when your Iron Man finally arrives! The temperature control is also adjustable. That’s why you will be able to choose the desirable freezing range without any effort. The leveling legs are flexible and the item is equipped with an inbuilt lock for your safety and comfort. All these possible adjustments provide a great level of customization. You can set everything up according to your needs. The inner LED lights provide the necessary illumination. You will have a good contents visibility even in the low-light conditions, for example, at night. The overall dimensions of the item are 33.5” H x 23.625” W x 23.6875” D. However, this giant weighs 42 pounds, that’s why it can be named quite lightweight in comparison to other devices! Basically, it is the lightest product on my list. 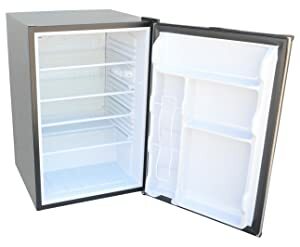 If you are searching for a good outdoor compact refrigerator, this item is for you. 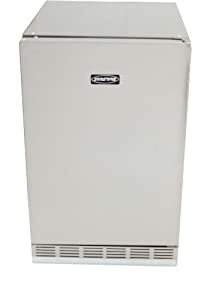 Lynx Outdoor refrigerator is well-designed and constructed from the excellent steady and lasting material. It is strong and advantageous to use. Seamless stainless-steel combats any environmental influences and that is what you would expect from the outside activity-rated item! It is one of the most advantageous outdoor freezer units. The fridge is characterized by an excellent storage capacity (4.1 cubic feet). You can manage the internal zone with modified racks. The racks are simple to remove, which makes cleaning and maintenance really simple. You don’t need special tools for modification, too! The optimal freezing temperature is reached through adjustable controls. The cooler has an impressive compressor, which is capable of maintaining alike and permanent internal temperatures in unpredictable climate conditions. The inside illumination is bright and crisp for the heightened clarity. The device’s dimensions are 18.5” H x 23” W x 25.5” D. It weighs 90.3 lbs. It can be installed as a built-in or separate unit. Summit Professional cooler is strong and steady. It doesn’t require much maintenance because of its ergonomic design. It is equipped with an automatic defrosting system. The all-stainless structure prevents any environmental influences. This fridge perfectly fits under counters and in tight spaces (24 inches). It can be installed as an inbuilt item or as a separate unit. The cooling process is provided by the fan-cooled compressor with the adaptable thermostat. It has a rapid-chill compartment, so you can quickly cool your beverages. The double-drawer design allows you to manage contents of your item. It is very simple to use, as you can separate the beverages from the leftovers. That’s why it can be called one of the best outdoor refrigerator-freezer combos. The general item’s dimensions are: 25.5” H x 23.8” W x 33.2” D. The weight is 140 lbs. This is a well-designed compact outdoor refrigerator produced from high-quality materials. It is not just covered but is completely built of 304 stainless steel. That’s why it is very solid and extremely lasting. The temperature management is quite straightforward – you can set up the desirable freezing range through the digital controls. The item will keep consistently even temperatures due to the dual-fan system. The fridge’s door is tightly sealed for the maximum cooling capabilities. There is an included key lock, so you can hide your valuables while you are away. This device can maintain the freezing range from 36 to 54F. The storage space is divided into three modified wire racks and one glass rack. They are stylish, beneficial to use and easy to clean. The general size of the item is 5.6 cubic feet, which is spacey in comparison to other items on my list. This device can be installed as an inbuilt unit or a separate kitchen item. The front venting system prevents overheating of the item due to the powerful ventilation. The door is reversible, so you’ll be able to open it from the right or left. That’s why it perfectly fits any summer or indoor kitchen. This freezer features a towel bar handle. The item’s dimensions are 25.5” H x 25” W x 34” D. It weighs 110 lbs. 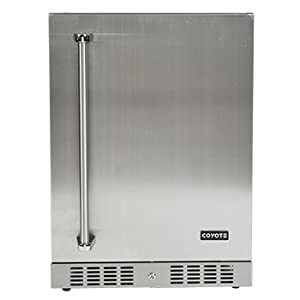 The Coyote 24” outdoor refrigerator is an excellent choice in an ultra-clean environment. 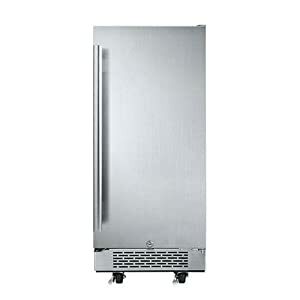 This refrigerators design uses a brushed stainless-steel panel with long door handlebar for easy opening and closing. The brushed steel makes the door less likely to retain fingerprint stains and is easy to clean. This model features a drop-in cooler as well as a full extension pull-out cooling unit. Both of which have built-in drains to assure the integrity of any stored items. This unit was designed for the outside, and is UL and DOE Certified, and is made of 304 Stainless-Steel. Its hinges are articulated and hidden for protection and better performance. The interior is graphite coated for extra thermic insulation, and it is lit by a cool backlight, and the digital thermostat can be adjusted for specific temperature control. The outer dimensions of this model are 23.5″ W x 33″ H x 22.5″ D, and its internal capacity is 5.5 cubic feet. The internal storage area comes with three roll-out racks, so it’s easy to place in and take out contents. This model comes with a standard locking mechanism, so you can store your goods overnight securely. Power usage: this model uses 115V at 60Hz, the circuit breaker fuse must be 15amps, and it comes with a Lifetime warranty on construction and manufacturer defects, frame and housing, and a one-year warranty on all other parts, components, and electrical. The design is personal; I am biased to the brushed steel look because it is so modern, sleek, and clean looking. It also fits in just about anywhere and with any color. However, as I stated, the design is personal. This model is priced very reasonably, it’s cost is a middle range, and it delivers more than it costs. Bottom line: I am starting out with one of my favorite models, its price is fine for the level of competence and integrity that this model provides, and honestly, it’s a fine looking model and even finer to use and enjoy. Click this link for the refrigerator manual in PDF. The Twin Eagles 24” Outdoor Refrigerator is the baby of Twin Eagles food processing equipment founder Dante Cantal. This model is made of grade 300 Stainless-steel and is fabricated with robotics and laser technology to produce the most accurate of fits. This model comes with 2 slides out perforated shelves and a door storage area. The dimensions of this model are 24″ W x 33.75-34.75″ H x 21.5″ D, and its internal storage capacity is 5.1 cubic feet. Twin Eagles is a well known and respected manufacturer of outdoor cooking equipment, and all their products are fabricated and assembled in the US. This unit is designed specifically for the outside and is an excellent companion to all your other outdoor appliances. If you have a bar top, then this will fit in perfectly. Just take note that this model is only right hinged. The brushed steel coating is an excellent choice for outdoor protection, and it adds another layer to assure resistance to the weather and environmental conditions. Personally, I find this model a great provider, but the price is steep, and you have to be prepared to pay for the brand. 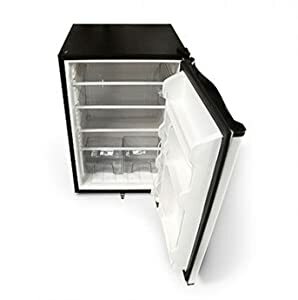 Just like buying a car, some like Subaru and others Lamborghini, this is the Lamborghini of outdoor fridges in its size, pricewise, but it does deliver performance too. Bottom Line: after all my whining about price, this is a highly versatile model a professional commercial model and if you run a respectable business, or prefer only the best at home, then this is the model for you to invest. The Lynx L24BF Refrigerator and Beverage Dispenser have three adjustable coated stainless-steel shelves. So, you can play around with the interior compartmentalization as you see fit. This is a commercial model, meaning its meant to last longer with more frequent use than a standard home model. The price reflects this fact as well. With this stated, what you do get is a very efficient, stainless steel outdoor refrigerator unit. The temperature range is limited, set at 33oF to 45oF. 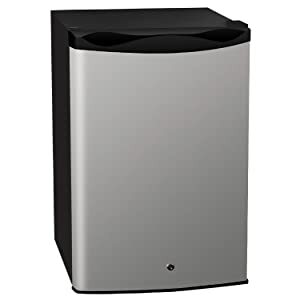 The overall dimensions are Width: 23 7/8″; Height: 35 1/16″; Depth: 26 7/8″ and it holds 5.5 cubic feet of storage space, and this model comes with reversible hinges, so you can open from left or right. This model comes with a standard locking mechanism, so you can store your goods overnight securely. Let’s get down to brass tacks. This is a great outdoor cooler, it was designed for the outdoors and designed for commercial use. This means it is found in restaurants, hotels and other commercial sites. You can buy it for home use; it’s a bit of an overkill due to its price. 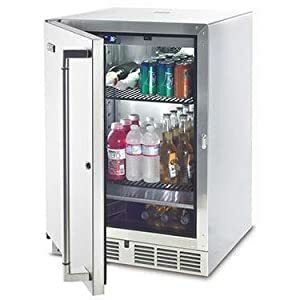 However, this cooler is designed to last, and if you have a house full of kids, then you might consider dishing out an extra buck and getting something that will last you a long time. Add to the wear and tear the outdoor environmental conditions, and you might really need this hummer of a model. Bottom line: this is a classic model, with very decent lines and performance, however, the price is definitely not for everyone. This is a commercial model best suited for bars, cafés and other sites where constant use is mandatory. The Summerset Outdoor Refrigerator is a budget-friendly outdoor model that provides ample space for the price you pay, which is low compared to many other models. This model provides 4.6 cubic feet of internal storage space, and its cut-out dimensions are 22″ x 33 1/2″ x 24”. The frame and interior are made out of 304 Stainless Steel, and it has two racks that can be adjusted to many different configurations. It also includes a crisping drawer and glass shelving, as well as an internal automatic halogen light with control switch, as well as a temperature control switch too. There is an internal cooling system that uses ambient air drawn in from under the unit. This model comes with a factory installed locking mechanism, so you can store your goods overnight securely. This is a very comfortable outdoor model, but it is also perfect for dorms and other personal spaces. This is a very simple yet professional model, it provides 33oF to 50oF and has glass, not plastic interior plates, which are much more durable and less likely to crack. Bottom line: The SSRFR-1B a great model to place anywhere, its price is right and its large enough to be useful, and small enough to be comfortable. It’s also an unnoticeable model, this means that when you place it anywhere, people will overlook it due to its simple design. 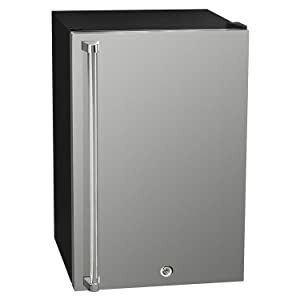 This is the RCS compact outdoor refrigerator is a 304 stainless steel constructed unit that provides ample space 5.6 cubic feet. The models dimensions are Width: 23.5″ x Depth: 24.75″ x Height: 32.75″ and weighs an impressive 108lbs. This model offers two adjustable wire shelves and a slide out wire basket. The interior lining is plastic, so its easy to clean and maintain. The temporary controls can set your range between 33oF to 43oF. This model was designed for the outside, and it is a heavy model, its purpose is to sit steadily even when filled to the brim. What is useful in this model is the pull-out basket, and the two shelves can be configured in any way using the inner side rack grooves. This model comes with a standard locking mechanism, so you can store your goods overnight securely. What I found great about the RCS outdoor refrigerator was its sturdiness. Built with wear and tear in mind, taking into account the outside elements, the many people, and kids that use the refrigerator and the time it’s in storage during the cold seasons. Although, personally, when the outdoors becomes an issue, I prefer to bring it inside rather than waste its time being empty. The recessed handle makes it easy to open and doesn’t interfere when standing over a counter. Its price is lower middle range and is excellent value for money. Bottom line: a great and versatile unit that can sit under any countertop, just alone. There are many different styles, designs, and sizes to choose from, but when you concentrate on a specific size, you end up finding one or two gems that stand out from the rest. This is one of those gems, the Summerset Alturi. There is already one Summerset model in this guide, and they are an exceptional company, fabricating some of the best products in their category ranges, this model is one of those exceptional value for money products, that you must have when you come across them in your search. Let’s start off with the 304 stainless steel construction, together with full temperature control, adjustable glass shelving and a crisping drawer. Glass shelving is much better than wireframe or plastic, it is both more durable, easier to clean and actually looks better too. We have to add the adjustable legs as well since they allow you to adjust the fridge to sit on any surface, even uneven ones that you sometimes find outdoors. This model comes with a standard locking mechanism, so you can store your goods overnight securely. This model is priced at the lower mid-range, but for what you get, it’s well worth the price. It comes with a reversible door hinge, as well as internal halogen lighting and its cut-out dimensions are 22″ x 33 1/2” x 24″. The bottom line is that this model got high points for delivering good quality at an affordable price. It is suitable for any business or home, and the price makes it well worth the investment. You don’t need to think twice when considering buying an outdoor refrigerator. 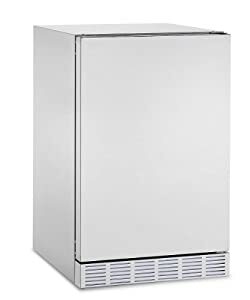 Every now and then a professional, commercial refrigerator unit comes out that is perfect for residential settings due to the price factor. This is one of that moment, one of those models. 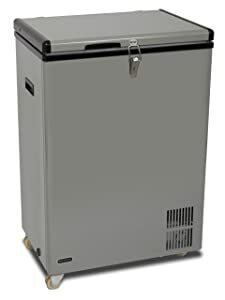 The Kokomo outdoor fridge is usually found in commercial sites, due to its amazing durability and reliability. Now, it’s available to everyone with a really affordable middle range price tag. The Kokomo is 34.75” x 24.5” x 34.75”, weighing 91lbs and provides 5.12 cubic feet of interior storage space. The door is designed for heavy duty frequent use and comes with a reversible door hinge and handle set. This model comes with fully digital touch controls, so you can power on/off at a touch, adjust the Interior Light, and control the temperature settings with ease. The temporary range is 34oF to 43oF, and it comes with front ventilation. This model has adjustable legs, so you can make sure the interior is flat to the outside surface, and it comes with 4 adjustable shelves. This model comes with a standard locking mechanism, so you can store your goods overnight securely. Why am I nearly raging about this model? 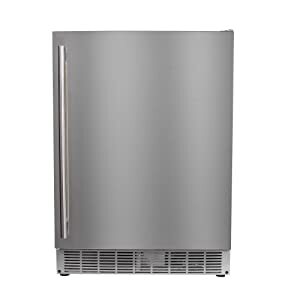 Well to start off with it’s an excellent outdoor refrigerator that is 100% professional, the all outside and interior stainless-steel look, the inside blue light and the touch controls all add up to an impressive unit. 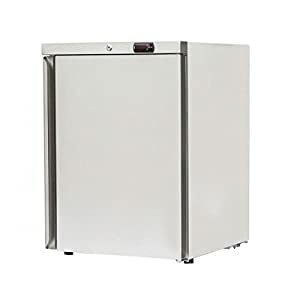 Now, add to this is middle range price, and you get an accessible and impressive professional outdoor refrigerator for any home and residence. 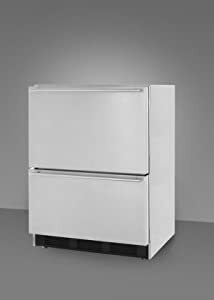 Bottom line: I like KoKomo refrigerators a lot, they are a brand name, and this is their more expensive model, due to its digital versatility. Well worth the investment for a serious outside experience. When it comes to innovative ideas, then the Whynter FM-951GW 95 Quart Portable Fridge / Freezer model has got it all. This is a cost-effective mobile unit that can be very useful on a patio or even in the home or office. 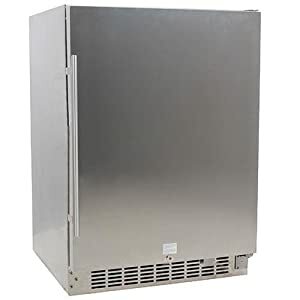 This not an ordinary fridge freezer unit, it’s a compact, mobile until, top loading, which means you don’t need to bend all the way down to get what you need, and it doesn’t need to stand on a table surface, or under the counter. Let’s discuss versatility. This unit has a very wide temperature control range, from -6°F to 50°F. The unit is powered by a 12V supply, which means you can enjoy this anywhere and everywhere. Not just outside on your patio, but take it with you camping, fishing or on a picnic. This means you can basically freeze anything edible and enjoy them wherever you sit. This model comes with a fast freeze mode, and don’t worry about the loss of thermal integrity, the lid comes with a built-in alarm. So, if your lid is not fastened the system properly will warn you. This model comes with a standard locking mechanism, so you can store your goods safely. The unit is designed to be slim and easily fit in any space, its outer dimensions are 24″ W x 19″ L x 33″ H, and it weighs 62lbs when empty. The interior is lit up with a LED light. Since this is a mobile unit, developed to be transported around anywhere and everywhere, the overall size and shape are made to match, which means it holds up to 3.17 cubic feet of storage. This is slightly smaller than most of the models reviewed here. On the upswing, this is the only real freezing unit, with fast freezing capabilities and it works on 12V. Bottom line, for the price you pay, you get one of the best deals in this guide. Just remember, it’s not compartmentalized, so you either freeze or cool, but not both. This is the Maxx Ice Indoor/Outdoor refrigeration unit that provides 5 cubic feet of great refrigeration in a classy commercial design. The brushed steel surface conceals a solid stainless-steel frame. The outside has a brushed stainless-steel finish; this gives you that commercial look. The interior is made of ABS, which is easy to clean, and the insulation is Polyurethane foam. The unit comes with an integrated condensate evaporator, so you don’t need a water tube, and it stands on four adjustable legs, which makes adapting it to any surface easy. This model comes with 3 adjustable metallic wire shelves, a digital controller, and digital temperature display, and the temperature range is 35° to 40°F (1° to 5°C). The outer dimensions are 23.625” x 23” x 33.5”, and the whole unit weighs 93lbs when empty. The interior LED gives a classic professional blue light or white light, and the door is reversible. The entire fabrication process is certified to UL, NSF, and CSA Commercial Food Grade Standards, and the overall result is a sturdy, reliable and very nice looking outdoor refrigeration unit. Bottom line: This is a low, middle price range unit and is actually very good value for money. It comes with a lot of features making it the best model in this review, but that’s just my opinion. This is the KingsBottle 140 Can Stainless Steel Outdoor Beverage Refrigerator, phew what a mouthful for a can holder. Actually, its much more than a can holder, although you can stack into it 140 cans, which is impressive, and was its original intention. This unit can be used to cool just about anything you want to remain fresh while enjoying the outside pleasures of life. The outer dimensions of this fridge unit are 23.4”W x 21.5”D x 32.3”H and its capacity is 4.34 cubic feet, and it weighs in at 132lbs when empty. What I like about this model is that it’s very quiet, and it is a focused model. This means it actually is intended to be a can cooler only. This means that internal temperature is evenly set and has hi-low temperature warning to make you aware of the core temperature. The temperature ranges are 34-46°F (1-8°C) and will operate within a tolerance of min/max room temperatures of 32-100°F (0 – 38°C). The units outer design is the industries standard brushed steel, and its internal covering is a classy, polished stainless steel. This is actually a nifty feature, although fingerprints can be annoying. It also comes with adjustable shelves, so you can play around with the internal compartmentalizing. The bottom line is that this is a can holding refrigerator par-excellence, and it comes with a slightly heavy price tag, sort of upper middle range. This is a great unit to have in a gym, a golf club, a tennis club, or a frat house, since it aims to provide a lot of cans, constantly. This is your classic refrigerator in a compact form. If you are looking for a great compact and versatile storage unit, then the Fire Magic 3590DR model gives it to you. Lest start off with the fact that this is a 304-grade stainless-steel refrigerator (standard industrial material) and has both internal storage with adjustable shelving as well as door storage. The cutout dimensions are 19 3/4” W x 34” H x 21 1/2” D, and it holds up to 4.2 cubic feet of capacity. The overall design takes into account that you might want a matching unit for your Fire Magic Grill, so Fire Magic made a refrigerator with a handle and design that matches your outdoor appliances. This model comes with a standard locking mechanism, so you can store your goods overnight securely. What I like about this model is that you can store those larger 2-liter bottles in it, so it does provide some storage versatility. The only downside is that it’s a right hinge model, but that’s OK, since the price you pay is so low, when compared to all the other models reviewed. Bottom line: Basically, this is the real deal, its budget-friendly, delivers what you need and will last a long time. It is unassuming and simple, which makes it a personal favorite to most homeowners seeking a comprehensive outdoor refrigeration solution. 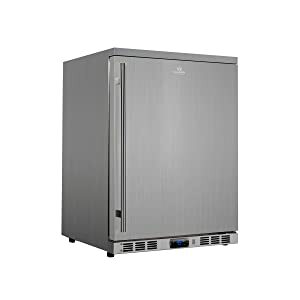 It’s time to close this review, and I am doing so with another Kokomo model, this time it’s their 4.6 cubic feet Outdoor Refrigerator. It might look the same as its older brother, but there is a reason why this one is a third of the price, so let’s take a look. To start off with its smaller, but not by a lot. Its dimensions are W: 21 3/8″ H: 32 3/4″ D: 21 5/8″ and it weighs 85lbs. Apart from the size difference, everything else is the same. Unlike the larger model, this one comes with manual touch controls, so you have to preset everything, and you cannot adjust the Interior Light. You can control the temperature settings with ease. The temperature range is 34oF to 43oF, and it comes with front ventilation. This model also has adjustable legs, so you can make sure the interior is flat to the outside surface, and it comes with 4 adjustable shelves. 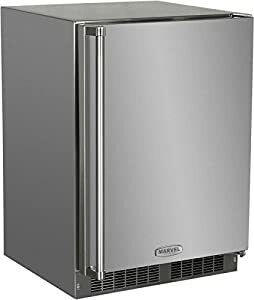 Why am I actually raging about this model, well to start off with it’s an excellent outdoor refrigerator that is 100% professional, the all outside and interior stainless-steel look, the inside blue light and the touch controls all add up to an impressive unit. Now, add to this is extremely low range price, and you get a very professional model at a very affordable price, why wouldn’t you buy this? It’s a brand name at a Chinese price, making it the least expensive alternative in all this review. Bottom line: this unit got the highest scores due to its price, based on the features you get and the quality of this model, I wouldn’t consider anything else, and actually prefer this model to its digital brother. The most common material to prevent decomposition is 304 stainless steel. It ensures excellent resistance to different environmental influences. The majority of fridges graded for outside use have a stainless-steel finish on the front door and handle, but some of them are produced completely from this material for the maximum durability and practicality. The UL approval means that the item is tested to show great working capabilities in the wet conditions. So this one can be safely used even in the rain! The outside freezing units are commonly small. No, you won’t be able to store a weekly food supply there! They are used mostly in summer kitchen cabinets for beverages and some ingredients/leftovers. But there are different options on the market. Average capacity for outdoor refrigerators is 4—6 cubic feet. Some great outdoor refrigerators provide excellent depot capacity. It is up to you to decide how much storage space you need. The dimensions of the item are equally important whether you are going to install it as an inbuilt item or as a separate unit. It should fit into your kitchen. Every cooler designed for the outside use has a venting system, which requires some space around it to provide effective ventilation. The majority of the freezers on my list can be placed both as an inbuilt device and as a separate unit. The difference is in the position of the ventilation system. The built-in installation needs the front vent system, while the separate application means the item requires at least one inch of free space on each side for the good ventilation. It is always nice to have a possibility to buy the item you love. There are different customization options for fridges, such as a reversible door, customized internal illumination and modified racks. While the changeable light color is a purely esthetical option, the readjusted shelves provide a functional storage space management. It is a great advantage to have the door that can be reversed. It means that you can switch it and open it either to the right or left. This makes the item perfect for every kitchen! The best outdoor coolers have a wide freezing temperature range. The rapid freezing compartment is a good idea because it allows you to quickly cool your beverages. Another essential feature of any freezing unit manufactured to perform outside is the capability to maintain even internal temperatures while working in an unsteady surrounding. That’s why the refrigerator should have an impressive compressor, the fan ventilating system, and tight door sealing. The automatic defrosting system prevents icing and helps to easily maintain your fridge. Another good option is a slide-out or removable shelves for easy cleaning of the item. Please note that the design and construction of the outdoor fridges don’t allow them to perform under temperatures below 40 degrees. If you live in a freezing climate region, it is advised to clean out the item and turn it off during winter. A good idea is to cover up the separate unit to prevent it from debris and environmental influences. I hope that this article was efficient in providing you with all the necessary information about the best outdoor refrigerators! Your perfect cooler is right here – I feel it! Just pick it according to your specific needs. Outdoor activities are fun, so I wish you to have a great time and enjoy the warm weather! I’ve selected the devices that were precisely manufactured to resist environmental and weather influences. They are forceful, spacey and functional – everything you can expect from an excellent kitchen accessory. When choosing the right item, you should focus on your preferences. Please remember that the item’s dimensions and the installation options are quite important, too!